Actually, I just documented it. 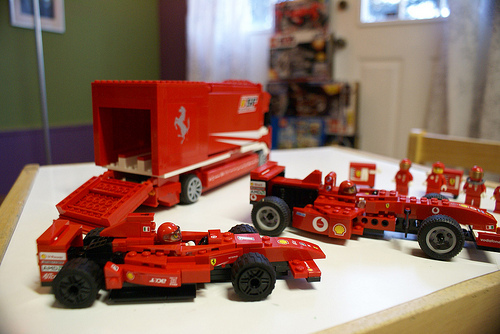 Our 6 year old son, a LEGO fiend received has last birthday present earlier this week, a full Ferrari F1 travel and pit crew. (With Schumacher going to Mercedes, this may be their last successful outing.) You can see in the background the stacked up boxes of all of his other LEGO presents, from just last week. He finished this large set in just two days, rather impressive I think. There is a whole set of photos at flickr. Is that the Millennium Falcon in the background?! Nice ferrari et al! This is for which boy in your family? Cheers! Wow. That is impressive for any age.